Thika Town MP Eng. Patrick Wainaina and his predecessor Alice Wambui Ng’ang’a hug each other at Thika Girls High School Karibaribi during the school’s prize giving day on Friday. The handshake bug seems to have struck Thika politics as Thika Town MP Eng. 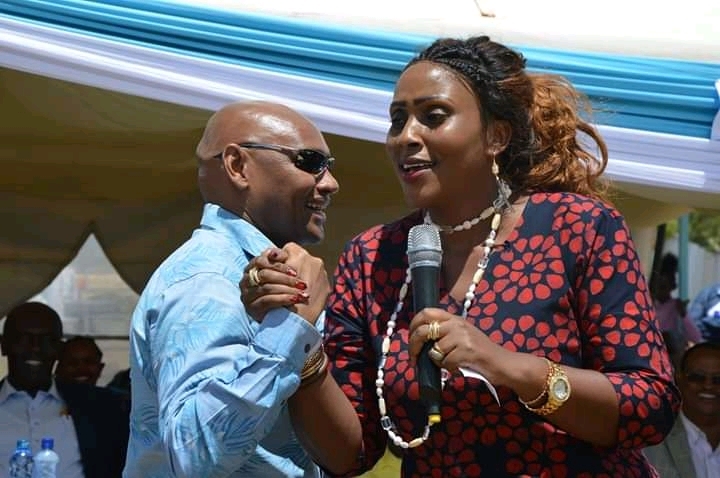 Patrick Wainaina and his predecessor Alice Wambui Ng’ang’a hugged each other at Thika Girls High School Karibaribi during the school’s prize giving day on Friday. In a rare show of unity of purpose, the two leaders who have not been seeing eye to eye promised to support each other’s development agenda devoid of any political intrigues. “I have no business stalling development projects started by my predecessor. Politics come and go but development is continuous. As your current MP, I promise to complete all the projects started by Hon. Alice during her tenure in office,” said Wainaina. He acknowledged the contribution made by Hon. Alice in laying the foundation that brought forth Thika Girls High School to the current state where it has about 500 students. A photo grid of the new dormitory and ablution block at Thika Girls High School Karibaribi. At the bottom is the previous condition of the block before completion. On her part, Alice recalled the history of the school since its inception in 2009 under the then area MP the late George Thuo through the government stimulus programme. Unfortunately, she said, after the exit from power of the late legislature, his successor Hon. William Kabogo abandoned the project for political reasons. “When I came to power, I took it to myself to revive it and make it a centre of excellence for girls who hail from Thika Town Constituency. I reclaimed this land which was so bushy and swampy and started working out the structures,” said the former MP. “This school is so dear to me and anytime you have a harambee to improve on the infrastructure of this school, I will be very ready to extend my assistance to you,” she added. Wainaina promised to improve the infrastructure in all public schools to the level of academies so as to make them attractive to learners. 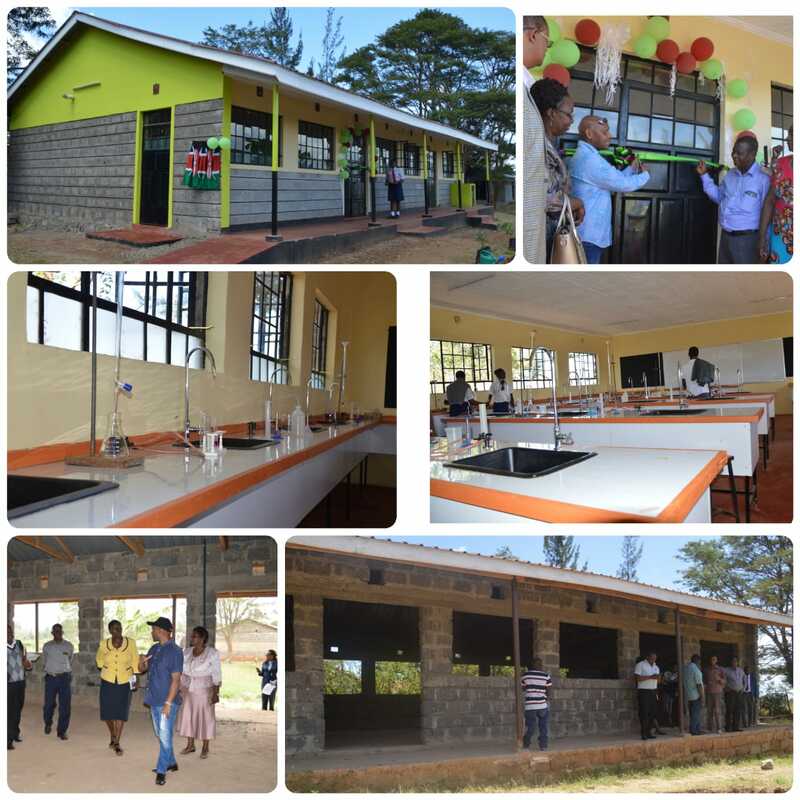 A photo grid of the new fully furnished modern laboratory at Karibaribi Mixed Secondary School. At the bottom is the facility before it was completed using the Thika NG-CDF under the stewardship of Eng. Patrick Wainaina. “I allocated sh. 6 million towards the completion of the dormitory and the ablution block we are commissioning today among other programmes. My next mission is to see that you get a borehole and later a dining hall,” said Wainaina. 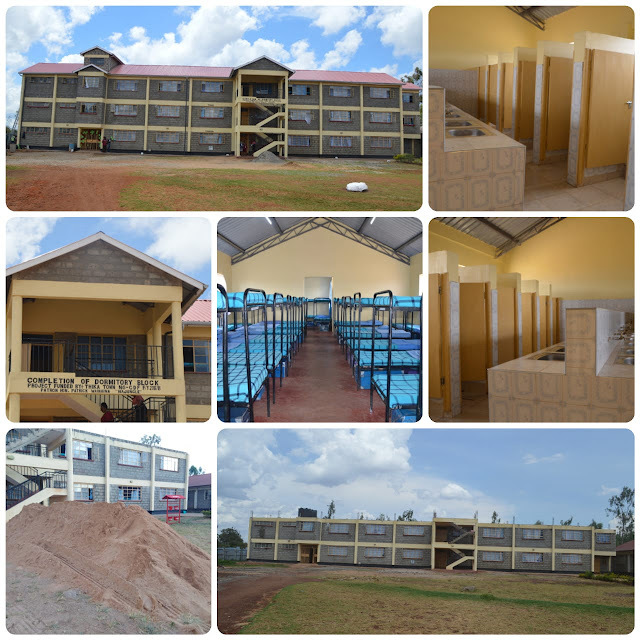 In a bid to ensure that Thika achieved a 100% primary-secondary learners transition, the MP said that he was targeting to double capacity of the existing facilities within the school to accommodate 1000 girls. “I intend also to expand three more secondary schools in the area to similar levels so as we can be able to accommodate 4,000 students annually both in Thika East and Thika West. I want Thika to have two main girls’ schools and two for boys,” he explained.